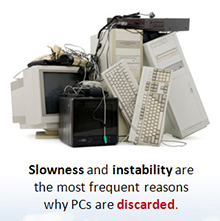 Are You Replacing PCs Prematurely? Slowness is something most business owners just can’t argue with, but savvy businesspeople know that any investment requires proper maintenance to maximize its useful life. A System Mechanic TotalCare® tune up can revive your investment and keep those PCs running like new – instead of buying new computers or wasting hours of your IT department’s precious time, so the only time you need to replace them is when you specifically decide it’s time to do so. Most modern business applications run adequately on 8-year-old PCs after a proper System Mechanic tune-up. Plus, an office full of tuned up PCs not only runs faster, but also helps you reduce power costs.